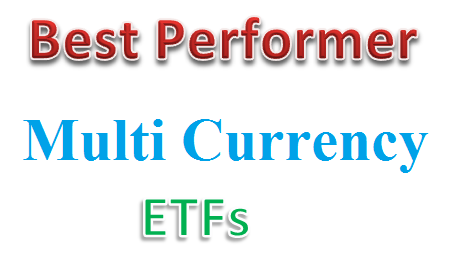 Best performing multicurrency ETFs 2014 are PowerShares DB US Dollar Index Bearish, PIMCO Foreign Currency Strategy ETF, PowerShares DB G10 Currency Harvest, etc. ETFs or Exchange Traded Funds has become popular investment vehicle for investors. You can buy and sell ETFs through your brokerage. You can invest this investment fund in your retirement account and possibly your 401k. One of the popular ETF categories is currency ETF. These Currency ETFs track a single foreign currency or basket of currencies by using foreign cash deposits or futures contracts. For the ETFs that use futures, excess cash is usually invested in high quality bonds, typically US Treasury bonds. The management fee is deducted from the interest earned on the bonds. Multicurrency ETFs can provide attractive choice for investors. These ETFs or ETNs invest in multiple currencies depending upon its objective. Some funds may invest in emerging markets currencies, world currencies, etc. These top performer ETFs are sorted based on its 1 year return (up to July 2014). You can find the fund review from this article. Other fund information can be found below such as expense ratio, Morningstar rating, fund’s NAV, managers, fund’s holdings, yield, etc. PowerShares DB US Dollar Index Bearish fund utilizes its assets to track track the value of the U.S. dollar relative to a basket of the six major world currencies - the euro, Japanese yen, British pound, Canadian dollar, Swedish krona and Swiss franc. The Index is a rules-based index composed solely of short U.S. Dollar Index futures contracts that trade on the ICE futures exchange (USDX futures contracts). The current share price is $27.02. This best performing multicurrency ETF has returned 4.00% over the past 1 year, and 0.22% over the past 5 year. Top 5 holdings are Euro (57.60%), Japanese Yen (13.60%), British Pound (11.90%), Canadian Dollar (9.10%), and Swedish Krona (4.20%). PIMCO Foreign Currency Strategy ETF objective is to provide exposure to foreign currencies. This currency ETF uses its assets to purchase currencies, currency forwards, or fixed income securities denominated in the currencies of foreign countries (non-U.S.). The total assets are $21.4 million. Its expense fee is 0.65%. This ETF has a 52 week price range of $45.32 & $48.77. In 2014, this best multicurrency ETF has year-to-date return of 2.46%. For the past 1 year, the total return is 3.88%. The fund’s CUSIP is 72201R734. Top 4 currencies are British Pound (United Kingdom), New Zealand Dollar, Norwegian Krone, and Indian Rupee. PowerShares DB G10 Currency Harvest has total assets of $99 million. Its expense fee is 0.81% per year. This index currency fund has no yield. The current share price is $26.21. The G10 currency universe from which the Index selects currently includes U.S. dollars, euros, Japanese yen, Canadian dollars, Swiss francs, British pounds, Australian dollars, New Zealand dollars, Norwegian krone and Swedish krona. This multi-currency ETF has returned 3.19% over the past 1 year, 1.74% over the past 3 year, and 4.39% over the past 5 year. WisdomTree Emerging Currency Strategy fund objective is to provide total returns reflective of both money market rates in selected emerging market countries available to foreign investors and changes to the value of these currencies relative to the U.S. dollar. It has expense ratio of 0.55%. It also has $111 million of assets. This ETF has Embedded Income Yield of 4.16%. Top 5 country allocation is Russia (ruble), Colombia (Peso), Turkey (Lira), India (Rupee), and Chile (Peso). iPath GEMS Asia 8 ETN is an index ETN (Exchange Traded Notes). The Index constituent currencies are the Indonesian rupiah, the Indian rupee, the Philippine peso, the South Korean won, the Thai baht, the Malaysian ringgit, the Taiwanese dollar and the Chinese Yuan. The market capitalization is $4 million. The share price is $45.70.